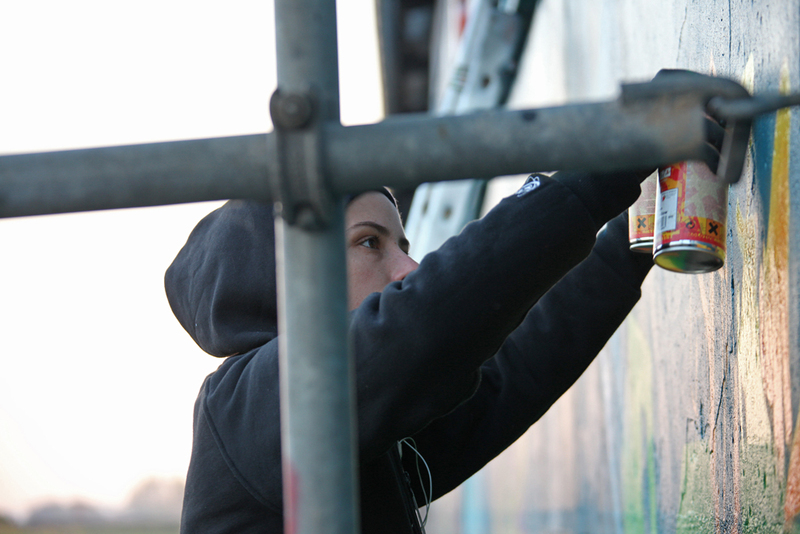 A graffiti artist who has taken on a serious challenge for herself, Mad C has just completed her momentous 700 Wall. 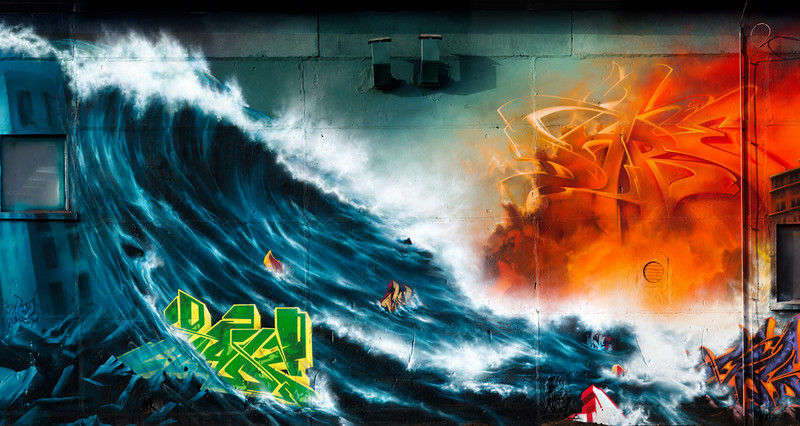 A member of the Bandits crew, who’ve dedicated themselves to creating graffiti art across as many nations as possible, Mad C is a street artist whose passions lies in writing and painting. The 700 Wall, a breath taking piece measuring 639 m2, was completed entirely by Mad C over nearly a year of full time work. She began planning and sketching in January of 2010, and just recently this month completed the piece. Following every step of her magnum opus, Molotow magazine covered her progress monthly, posting pictures of her sketches and beginning stages of painting. 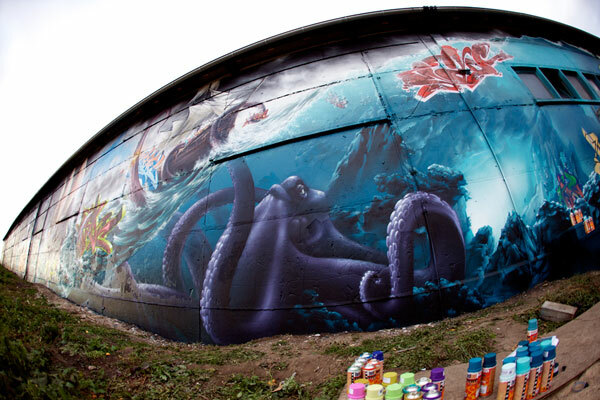 The wall takes you through a journey of mischievous lab rats, gun-toting robots, menacing ocean animals and ship wrecks and ends with an urban skyline… the amount of detail that went into the piece is unbelievable. Mad C’s color combinations bring the rats to life and make you feel as if you’re truly standing in front of massive machinery. 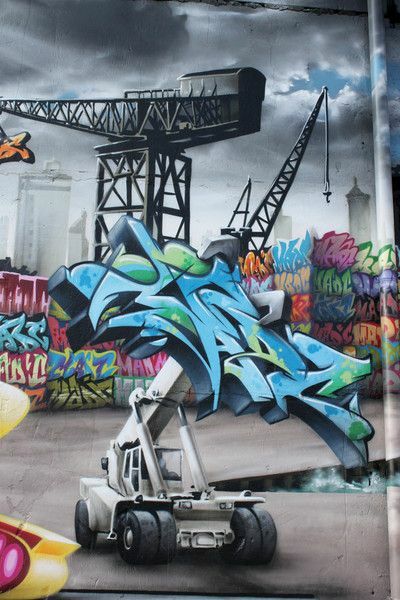 Incorporating her own Mad C tag into the wall over 100 times, the concept behind the 700 Wall was “Style Machine” — playing off the idea of a machine producing different styles. Mad C broke down the concept and translated it into 5 different scenes: “Scene one: the laboratory – we sketch, we try, we are inspired, no matter under which circumstances, lack of time or interruption. Scene two & three: the machine and harbour – we select sketches and produce our ideas, try techniques, style- and colour-variations and get them out into the world. Scene four: the difficult journey – a lot of our work gets destroyed f.e. by the buff, toys or by the nature, so we have to keep on doing our thing no matter what. 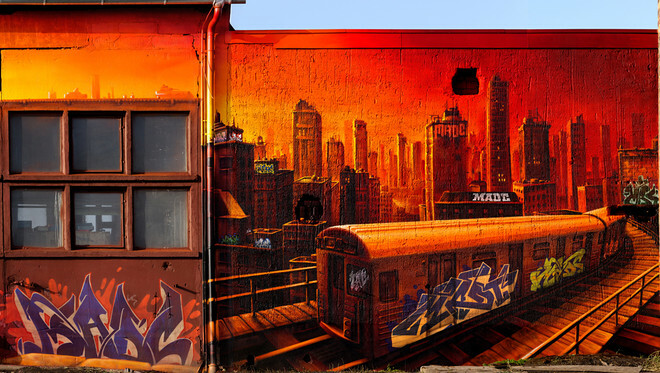 Scene five: the city – you keep on sending your name into the world, so at the end of the day some of your pieces reach their destination, where they belong and where they are seen.” After working every day on the 700 Wall for a year rain or shine, using 1489 cans of spray paint, 158 colors, over 600 caps, 100 liters of primer and 140 liters of exterior paint, Mad C’s masterpiece is finally complete. This project on its own is one of the biggest graffiti pieces seen yet, and the fact that it was completed by one girl flying solo says a lot about Mad C’s raw talent and ambition. Her incredibly detailed work is worth investigating — check out some of her other pieces found across the globe on her madc.tv website, including pieces found right here in the US, Austria, Berlin, Netherlands, Denmark and Poland.